Actually, a dress swap for a royal bride is not that uncommon. As the British royal wedding of Prince Harry and Meghan Markle nears, the Kensington Palace public relations team (come on, you know there is one!) is continuing to do a splendid job of teasing details to the public. We've got a date! And a venue! Word about the guest list! A photographer! Wedding china! But what we don't have — and what we all desperately want — is any scoop on Markle's wedding dress. Of course, the veil of secrecy seems justified (an element of surprise would be nice for a gown that will someday live in history books), but that hasn't stopped the speculation. The recent buzz? 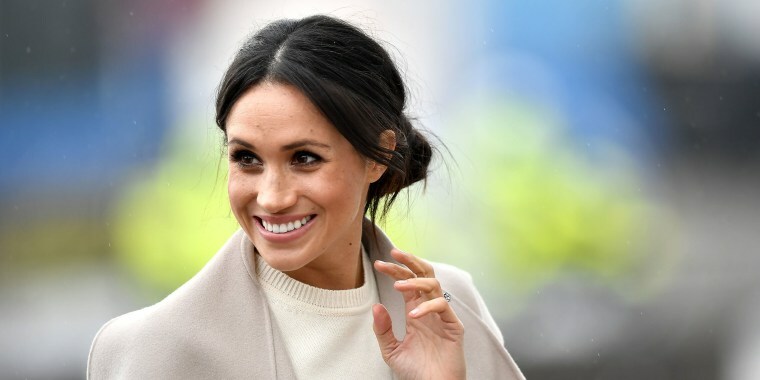 Word has it that Markle is expected to debut not one, but two wedding dresses on her big day. "She will have two dresses, one for the ceremony and another dress for the evening," a royal source told Vanity Fair. "The plan is for her to change after the ceremony so that she can party the night away in something glamorous and less restrictive. ... The wedding dress itself will be traditional and elegant. There is talk of some lace and sleeves and Meghan has been working very closely with the designer who has been sworn to secrecy." This intel has not been confirmed — but it's perfectly possible. Lest we forget, the former Kate Middleton donned two dresses in her 2011 wedding to Prince William. The first, of course, was the now-iconic Alexander McQueen dress she wore walking down the aisle at Westminster Abbey. The lace-entrenched, V-cut bodice inspired many future dresses — even this H&M one! — to come. The Duchess of Cambridge then wore a different dress to the evening wedding reception. She slipped into another Alexander McQueen creation, a satin gown with a belted waist paired with a knit bolero. After all, a reception dress swap for the bride is not uncommon. Take tennis superstar Serena Williams, who boasted three different gowns during her wedding to Reddit co-founder Alexis Ohanian in 2017. Duchess Kate's own sister, Pippa Middleton, was also rumored to have worn two dresses when she tied the knot last year. As the entire world has been invited to marvel at the royal wedding from near and afar, we can totally get on board with Markle putting her best fashion foot forward. After all, this is the event of the year.